[tps_footer]Akshay Kumar and Sajid Nadiadwala, share a terrific relation with the people they work and it shows via their association, which have been running for decades. However Sajid and Akshay are one of the very few from the industry, who share an excellent camaraderie. They both mark their 8th film together with ‘Housefull3′ which releases on 3rd June.Akshay has an extra special equation. He has often remarked that the similarities between the two are uncanny . Both went to the same school. They also linked up with one another earlier on in their careers with Akshay doing ‘Waqt Hamara Hai’ (1993) with him. Then there was an eleven-year gap and the two reconnected with ‘Mujhse Shaadi Karogi’ (2004). After that, their bond only grew stronger. Akshay did ‘Heyy Babyy’ and the ‘Housefull’ franchise with “Nadiad“, whom he often playfully calls “Sundi“. The similarities don’t end here, other than professional lives the similarities are very much present in their personal life. Both of them married in the same year, i.e. 2000. Sajid’s son Subhan was born two days after Akshay’s son Aarav . Both were born in the same hospital, in the same delivery room! First Sajid visited Akshay to wish him on the birth of his son and two days later, the actor visited him to congratulate him for the birth of his baby boy . This producer and actor live in the same building in Juhu currently . Both have the same brands of Indian and imported cars. And it’s not even as if they have ever compared notes or said, `Oh, you are buying a Bentley , so I will buy one.’ It has just happened.The actor and the producer, often share a Sunday brunch and soak in some sun at the beach near their home, bask in each other’s friendship. 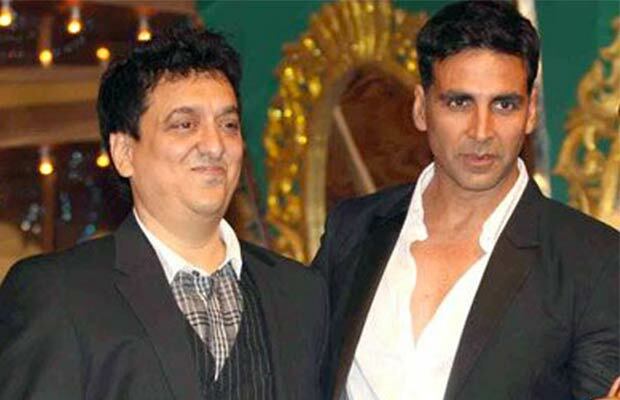 Sajid Nadiadwala led, team ‘Houseful’ is back with its third installment of the franchise ‘Houseful3′. This time the team is not only to bring to celluloid a power packed star cast with triple the dose of entertainment, but also to have jokes multiplied into the power of three! ‘Housefull3′ is to showcase three couples, Akshay Kumar and Jacqueline Fernandez, Abhishek Bachchan and Nargis Fakri and Riteish Deshmukh and Lisa Haydon. With the strong buzz surrounding the film, ‘Houseful3′ is sure one of the most anticipated releases this year. Next articleFarhan Akhtar In Scripting Mode!